Here’s the real deal with 2017 Bordeaux. It’s not the vintage of the century. 2017 Bordeaux will not make you forget 2016, 2015, 2010 or 2009. However, there are a few great wines from the vintage and a lot of very good wines as well. There are also wines that feel heavy handed, when the estate tried producing concentrated wines, ending up with dry tannins and a dry finish. 2017 Bordeaux is a stylistic choice, you are going to like the character, which can be bright, focusing on red fruits or not. Generally, the wines are; medium bodied, fresh, aromatic and lighter in alcohol than sunnier vintages. The tannins are soft. The fruits are sweet and the majority of the wines will be enjoyable early in life. Generalities are not of much use. But with 2017 Bordeaux, it is not a vintage of specific appellations. Instead, it is of localized terroirs. The gravel slopes in the northern Medoc, especially in Pauillac produced extremely strong wines. The Left Bank is generally more consistent than the Right Bank as you will see in the short analysis below on each of the most important appellations. The best wines follow an almost straight line from north to south. The further south you travel, as you will see, the more difficult and less homogenous it becomes. Pauillac is the most successful appellation of the vintage. Almost every wine I tasted showed beautiful Cabernet Sauvignon characteristics. St. Julien is next and in St. Estephe, the vineyards located closest to the Gironde were very successful. The top of limestone plateau in St. Emilion, and in the gravel slopes next to Pomerol lay claim to producing very good wines. The Pomerol plateau in both the clay and gravel terroirs allowed producers to make very good wines as well. 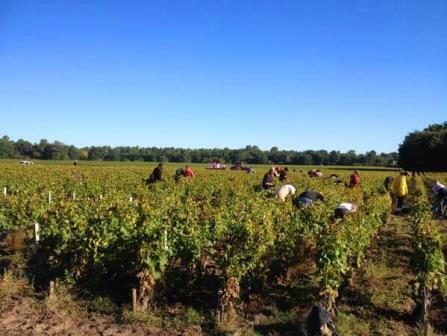 Sauternes enjoyed an extremely successful vintage! In fact, 2017 Bordeaux is fabulous for the dry white Bordeaux wines. However, other less heralded terroirs had a more difficult time. As usual, the success of the 2017 Bordeaux campaign will come down to the prices being asked for the wines. There are several things to consider when pricing the vintage. The currency exchange rate has made it much more difficult for the American market to absorb a lot of the wines. Plus, 2015 and 2016, both better vintages sold quite well, and there is only so much money available. Hopefully, the chateau will take that into consideration, if they want the wines to sell through to the consumers and not just to the negociant. As a point of interest, by the middle of April, a few estates were already offering their wine. Chateau Giraud, Chateau La Couspaude, Les Grandes Chenes and Chateau Lanessan all offered their wines by April 18. Rumors are circulating that some larger estates will begin offering their wines before April has run out of days. Monday, April 23 was an interesting day as Chateau Palmer and Valandraud, both important wines were released at about 20% less than they sold for in the better, 2016 vintage. Aside from a moderate discount that other estates will need to match or beat, the campaign also looks like it will be a quick one, which is good for the market. Wednesday, April 25 saw a few more estates releasing their wine, Labegorce and most notably, Haut Batailley. Why Haut Batailley? Haut Batailley was recently purchased by the Cazes family, and thus, not 2016 wines was release. So the price comparison is with the 2015 vintage. While most chateau have released their wine at a discount to 2016, their most recently offered vintage, Haut Batailley jumped over 46% from 2015! While some consumers are having an initially difficult time with the price adjustment, especially when the vintage is enjoying only tepid demand, this is merely an adjustment to future market conditions, with a new owner that is determined to impoive the quality of the wine made at Haut Batailley. 2017 Bordeaux will be remembered as the year of the great frost that struck just after the tastings, April 27 and 28, with temperatures as low as -4 Celsius on both nights. But due to climate changes and increased knowledge on how to combat impending frost, the vintage is not the disaster that estates withstood in 1991. The well-financed estates were able to employ helicopters, heating candles, sprinklers, windmills and other methods to save as much of their harvest as possible. They did everything except wrap the grapes in blankets. Those life saving methods helped the top estates save a large portion of their harvest. Other vignerons were not as fortunate. The damage from the frost should not be underestimated. Numerous vineyards in Saint Emilion, Cotes de Bordeaux, Entre Deux Mers, Graves, St. Emilion satellite regions, Lalande de Pomerol, Fronsac and even in Pessac Leognan lost their entire crop. Vineyards in Haut Medoc, Moulis, Listrac and Margaux were also damaged. And before you start thinking, they are rich, they can afford the loss, think again. Most of the vineyards hit the hardest are owned by small producers that make their livelihood from their wine. It is not their hobby, it is their life. As you can see from the list of names, many of the appellations known for producing Bordeaux value wines were slammed the hardest, making 2017 a difficult, but not impossible vintage to seek out petit chateau and wines from less heralded terroirs. In the Left Bank, the top estates, close to the Gironde were protected by the heat retention from the water and their gravelly slopes. The same can be said for those situated on the plateau of Saint Emilion. As we mentioned earlier, the frost affects the yields. As a point of comparison with 1991, in the preceding vintage, yields were down to an average of 18 hectoliters for Bordeaux. In 2017, the universal average was closer to 32 hectoliters per hectare. I have numerous friends that lost 80-90-100% of their crop. They are just hoping that 2018 will be a good enough vintage to allow them to recover. I hope so as well. Keep in mind, frost does not determine quality, or character. It only affects the yields. Overall Bordeaux will produce about 40% less wine than they were able to release with the 2016 vintage, to give you an idea of the loss. The next problem comes from what is known as second generation fruit. Those are the grapes that budded after the frost. The issue here is that those grapes start off the year so late in the season, most do not have enough time on the vine to ripen. Using second generation fruit works for some estates, especially if the variety is late ripening, as the fruit had a chance to mature. If the estate tried increasing volume when the grapes were not ripe, the wines showed green characteristics, or shrill acidity and dryness. The majority of producers discarded their second-generation fruit for those reasons, although a few estates were lucky enough to be able to incorporate some of the second-generation grapes into the blend, especially when it was the Cabernets. The frost only tells part of the story. 2017 Bordeaux ended the same way it began, early. The winter was cold with lighter amounts of rain than usual. By February and March, things heated up in Bordeaux, and bud break came as much as a week early for some estates. The end of April saw the devastation from the worst frost in 27 years. The damage at many estates as we mentioned was devastating. By the end of the spring, things heated up, with flowering taking place by the middle of May. Flowering was homogenous and rapid. At this point, the vineyards not affected by the frost were in good shape. June saw rain, making it wetter than usual. June also endured warm, sunny conditions. Some of the June nights were warm as well. From June 8 to June 22, several days hit at least 31 degrees Centigrade. Temperatures spiked June 13 to June 22, with highs hitting over 37 degrees! For those that were in Bordeaux for Vinexpo, they will remember the relentless heatwave. I recall driving to Pessac Leognan for the Fete de la Fleur where the temperatures reached up to 41 Celsius, 105 Fahrenheit! It was so hot, the vines in many areas were suffering from water stress, which slowed down the rapid growth cycle. Fortunately, a lot of rain fell at the end of June, providing much needed nourishment for the vines, some of which had shut down as they were experiencing vine stress. July and August were very dry. But temperatures were cool, and there was a lack of sunshine. Still, the vintage was set to be an early harvest and veraison came a little early. Drought conditions appeared in several vineyards. By the middle of September, it began to rain. In fact, the month was wetter than the average September. The initial rains were desired after the dry summer. But it continued raining, which had the potential for diluting the grapes and the fear of rot was a moderate possibility as several estates were already harvesting, as 2017 was an early vintage. Things began to dry out the following week, so growers with nerves of steel were rewarded as the grapes has more time to mature. Harvests for the Merlot came early with growers beginning to pick September 8. Most growers finished harvesting by October 5. The grapes are generally small, with thick skins and a good skin to juice ratio. Depending on when the growers picked determined the amount of water in the vineyards they needed to contend with. The key to the success of 2017 Bordeaux was in selection and focusing on exercising a gentle touch during the extraction period. Putting the pedal to the metal was not the right plan this year. 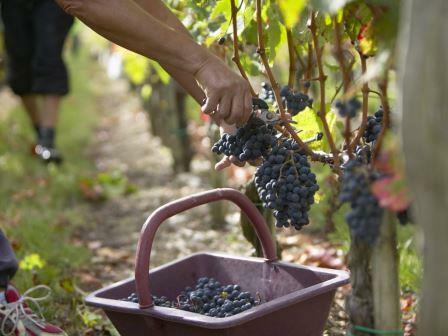 The white Bordeaux wine grape harvest was even earlier, with picking starting to take place in August.